OmniEarth, an analytics and information company, released Yardographics. Powered by the OmniParcels database, Yardographics identify, categorize and analyze property attributes and landscape features within geographic areas. 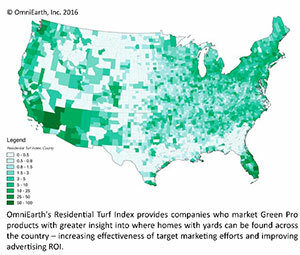 Yardographics help green industry manufacturers and professionals make the most of marketing budgets by supporting pinpoint targeting of tactics such as direct mail and local advertising, according to the company. OmniEarth’s team of data scientists and remote sensing experts apply a set of proprietary algorithms to combine aerial and satellite imagery with other geospatial data to determine the existence, size and shape of property and landscape features on areas of land. Yardographics identify and quantify the footprints of buildings, impervious surfaces and turf and locate features such as pools, decks and solar panels. A sample data set is also available for a free download.